Asked about the potential of the new iPad mini eating into its existing iPad sales, the company's chief executive Tim Cook said it has "learned not to worry about cannibalization of our own product." The analyst had asked how Apple expects the iPad mini to sell compared to the original iPad, phrasing this as its "cannibalization factor over the older product." Cook began by answering, "we don't really have an old product. We have only new products. 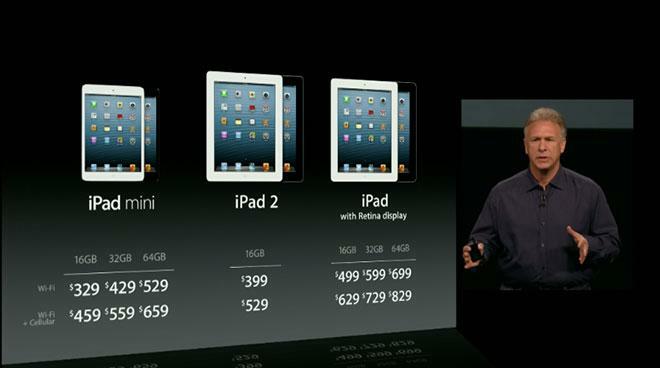 We just announced the fourth generation iPad." He continued, "The way we look at this is that, we provide a fantastic iPod touch, we provide an incredible fourth generation iPad, iPad mini and iPad 2. Customers will decide which one, or two, or three or all four they would like and will buy them." Cook seemed to be correcting the idea the full sized iPad was "old," but of course Apple does still sell a variety of "old products," including the iPhone 4 from 2010, last year's iPhone 4S, the previous generation iPod touch as well as last year's iPad 2. "We have learned over the years not to worry about cannibalization of our own product," Cook said. "It's much better for us to do that than for somebody else to do it. "And the far, far bigger opportunity here are the 80-90 million PCs that are being sold per quarter. There's still over 300 million PCs being bought per year. "And I think a great number of those people would be much better off buying an iPad or a Mac. And so I think that's a much bigger opportunity for Apple. And so instead of being focused on cannibalizing ourselves, I look at it much more that it's an enormous incremental opportunity for us." In the early 1980s, Apple worried that sales of the Apple III would be hurt by the existing Apple II if it made them cross compatible, so it limited the backwards compatibility of the new model in order to encourage the development of new Apple III-optimized software. This backfired, contributing to the demise of the Apple III, the company's first significant product failure. Apple's Lisa and Macintosh teams also rivaled for product attention within the company, and after the Mac emerged as a winner, Apple continued its incompatible Apple II line, fostering contention between the two product families championed by the "Apple II Forever" slogan promoted by its chief executive John Sculley. Rather than backing Steve Jobs' plans to make the Macintosh into a business workstation, Sculley focused the company on profiting from the aging Apple II, a move that helped push Jobs out of Apple, where he developed NeXT, the basis of what would become OS X. Apple continued selling old Apple II systems into the 90s. At the same time, Sculley was trying to manage the introduction of tablet computing, which was complicated by two warring factions within Apple, one aligned behind Newton, the other a competing concept that was spun off as General Magic. But then Apple worried that Newton sales might eat into its existing Macintosh line, so it purposely limited the Newton platform to PDAs. After Steve Jobs returned to Apple, he refocused the company on profitable products. After recognizing the trend toward portable systems, he invested in notebooks and allowed them to eat up sales of Apple's desktop models. He also backed the iPod, allowing it to overshadow Mac sales. Jobs' Apple also backed iOS devices over the embedded iPod software, allowing the new iPhone to eat up its iPod sales. Jobs, and now Cook, similarly avoided any efforts to prevent education and other markets from buying up iPads at the expense of more costly Macs. The result of giving people what they wanted has resulted in Apple selling mostly lighter, thinner notebooks that share iPad design elements, while dropping its Xserve and other products that people weren't showing much interest in buying. At the same time, Mac sales overall have grown dramatically, from less than one million per quarter just five years ago to around 4-5 million per quarter today. Apple is also now selling more mobile Macs (which Apple just noted make up 80 percent of its computer sales). Whether these numbers have been blunted by iPad sales in some markets doesn't seem to matter, because Apple now sells 14 million iPads per quarter as well. Cook's suggestion that iPad sales have gnawed on PCs more than the Mac appears to be true, given that Apple continues to outpace the growth of the PC industry (globally, Apple said Macs are up 1 percent, contrasted with an 8 percent decline by PCs in general).